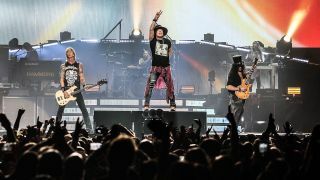 Have Guns N’ Roses been back in the studio? Rumours are swirling than Guns N’ Roses have been back in the studio together. Rock and metal broadcaster Mitch Lafon says there are “unsubstantiated reports” that the band have recorded a cover of Children Of The Revolution for inclusion on an upcoming T-Rex and Marc Bolan tribute album, which will be released through BMG. Mitch says on Twitter: "Unsubstantiated reports claim Guns N’ Roses have recorded a cover of T-Rex’s Children Of The Revolution for inclusion on a upcoming tribute album. While Guns N’ Roses have yet to be confirmed, Variety report that other artists who are slated to appear on the record also include Nick Cave, Perry Farrell, Marc Almond, Kesha and Borns. The project is said to be a companion to an upcoming Marc Bolan and T-Rex documentary, with Hal Willner is producing the album. Earlier this week, GNR bassist Duff McKagan revealed he was putting the finishing touches on a new solo album with producer Shooter Jennings. No firm release date has been revealed, but the untitled album is expected to launch at some point in 2019.